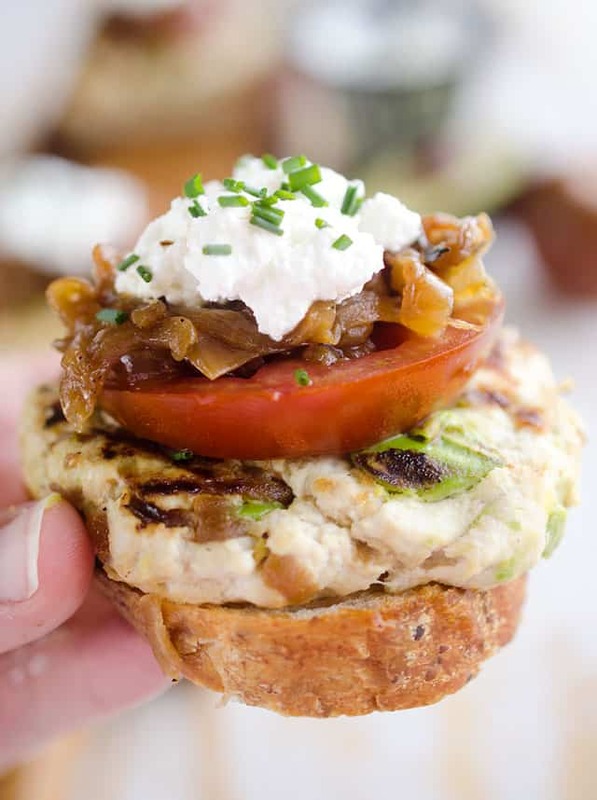 Ultimate Turkey Burger Sliders are the perfect healthy game-day appetizer or dinner. 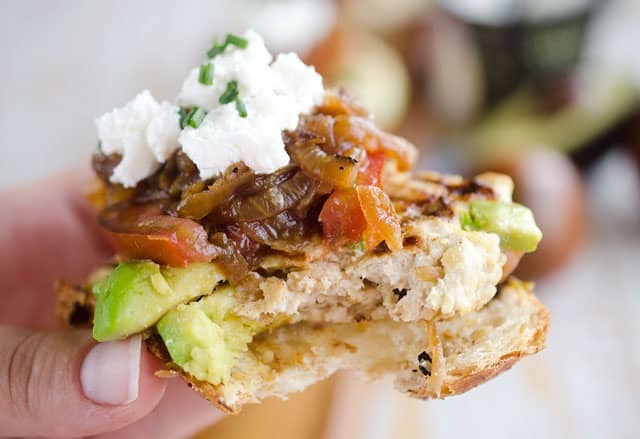 The lean turkey burger is loaded with caramelized onions and avocado to keep it moist and topped with the best burger fixings for the ultimate slider that is healthy and delicious! Football season is officially here and I am so pumped about it! Most of you probably haven’t gotten to see your team play yet, but in Minnesota we already have our first pre-season game under the belt. Last Sunday, we played Pittsburgh in the Hall of Fame pre-season game and took home a victory…not that it counts for anything. Pre-season doesn’t quit have the same allure as regular season games that actually matter. The first quarter is the only time you will get to see the regular starters play, if at all. Despite it being relatively unimportant, it quenches us football fans thirst for some football after a long awaited break! The last few seasons have been rather depressing for Minnesota fans, but this year there is some hype that we might make a bit of a splash. With our star running back returning to the lineup, our young quarterback having a season’s experience and one of the best rated drafts, we have reason to get excited. For all of you non-football fans, whose eyes have already glazed over, I have these Ultimate Turkey Burger Sliders to redeem myself with! 🙂 Whether you have a husband who insists on watching games all Sunday or are invited to a friend’s house to watch their favorite team play, you have great food to look forward to at the very least! We all know football and good food go hand in hand. The only problem with that is that football food usually consists of cheesy, greasy goodness. 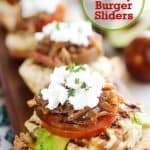 I love that stuff as much as the next guy, but if you are trying to watch what you eat, these sliders are the perfect addition to your spread. 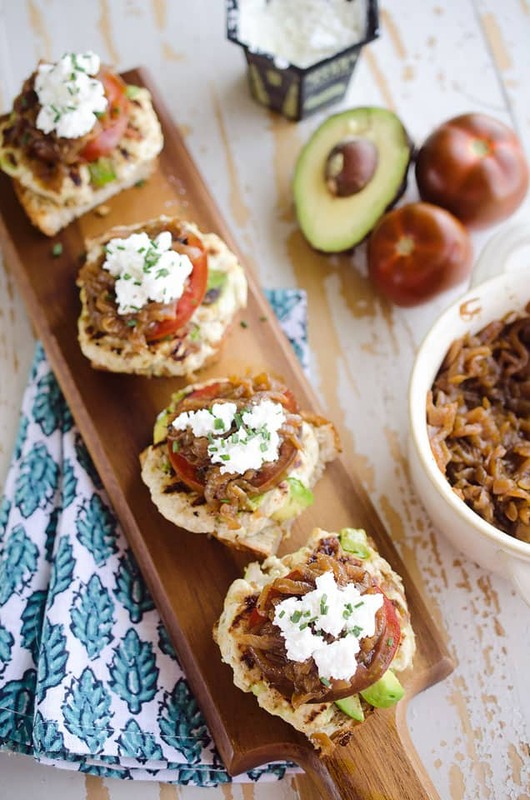 They are loaded with sweet caramelized onion, avocado and goat cheese for an explosion of great flavors. They taste so good that even the biggest red-meat loving football fan will scarf them down, not realizing they just ate something “healthy”! You can top your sliders with another piece of bread to make a true sandwich or even sandwich it in adorable mini bun. In my case, I left them open-faced on a half piece of whole-grain bread to cut down on the carbs. Whatever you do, don’t skip the caramelized onions. They are time-consuming but very simple and so worth the added flavor they bring to the burger. 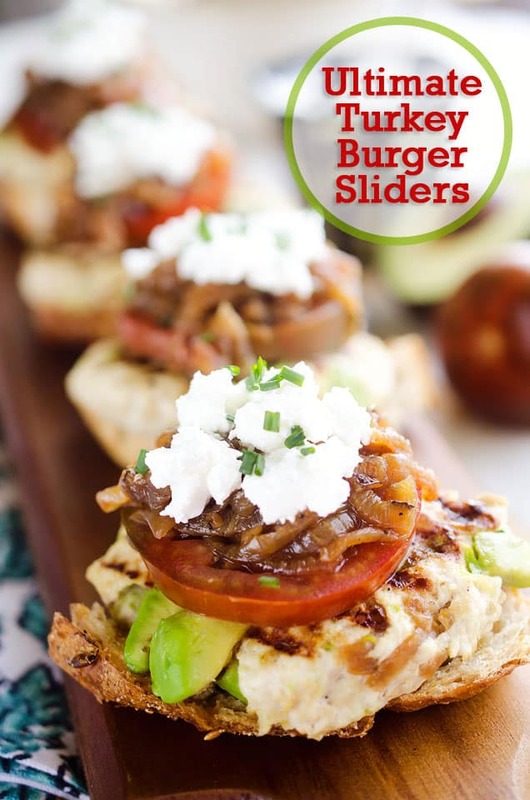 Ultimate Turkey Burger Sliders are a healthy appetizer or dinner with lean homemade turkey burgers, caramelized onions and avocado for the ultimate slider! In a medium bowl, using your hands, combine the turkey, Dijon, Worcestershire, bread crumbs, salt and 1 c. diced caramelized onions. Once everything is roughly combined, add in the cubed avocado and gently work it into the meat mixture. Form the mixture into 3-4 inch patties and place on a baking sheet. Refrigerate covered for 1-2 hours. On a medium-high grill or skillet, coated with non-stick cooking spray, cook each burger for 2-3 minutes on each side. Meanwhile, slice your bread into thin pieces and cut each slice in half. Spray each piece of bread with non-stick spray and add them to the grill for 1 minute on each side to toast them up. 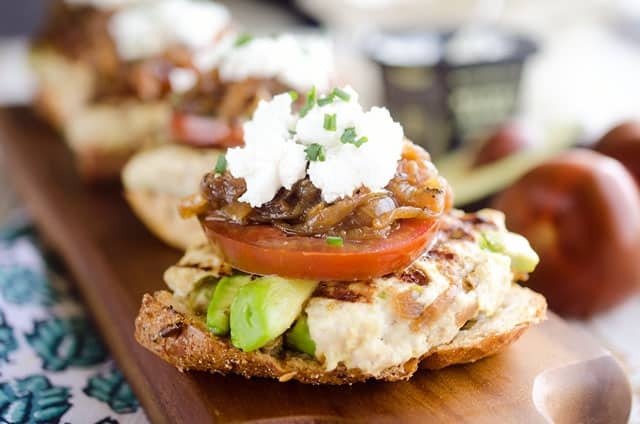 Top each piece of bread with a burger, slice of tomato, a Tablespoon of onions, dollop of goat cheese and sprinkle of chives. Serve immediately. 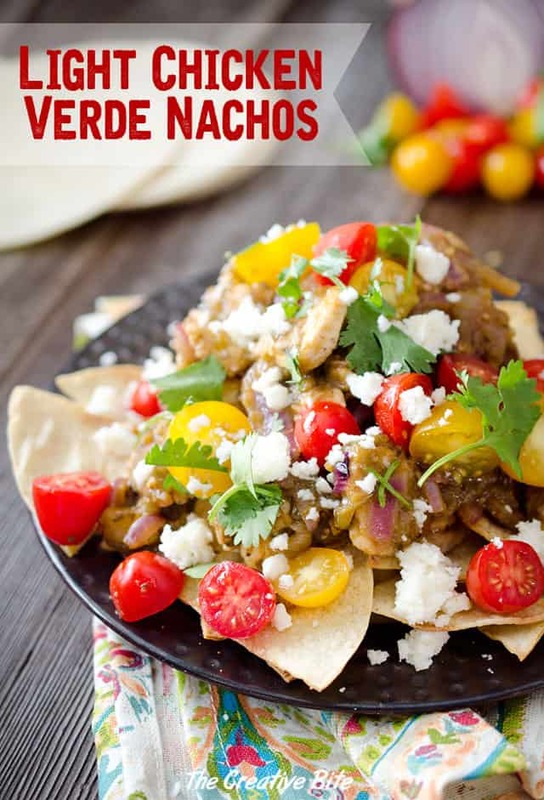 More Healthy Game Day Favorites! Let’s hope there is a new spark on the Vikings team. It’s been rather desperate lately! I’d love to watch a game enjoying these sliders! Oh my goodness! 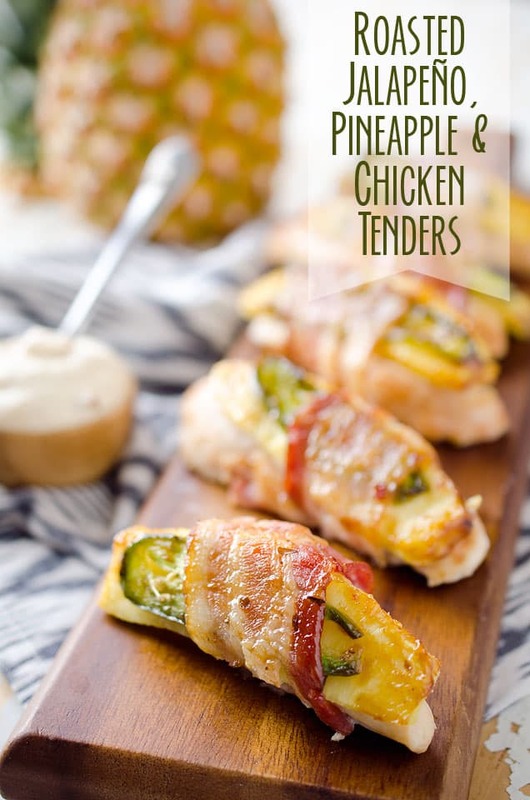 Great idea to serve these yummy bites on sliced bread instead of slider buns. I often feel like the buns overwhelm the burger when they are smaller. 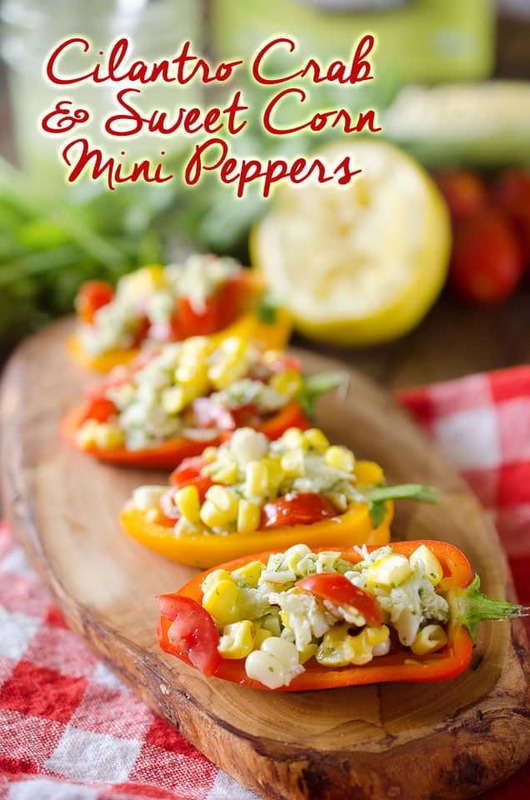 I linked to this post in a round up of healthy father’s day recipes. http://www.halfhersize.com/healthy-fathers-day-recipes/ Thanks!